Jack Rutberg Fine Arts presents an overwhelming, if not monumental, installment of work by the Catalan artist Jordi Alcaraz in what can simply be described as a paragon of contemporary high art. We can gather from the works that Mr. Alcaraz dances effortlessly in his exploration of our conception of space yet is successful with an emotional verve of placidity, positively tranquilizing the subjective viewer in the process. Most of his work operates under an Oriental conception of being as an uninterrupted continuum between what has been and what will be. This is not to say Mr. Alcaraz necessarily has digested Buddhist philosophy; more so, his work is a rejuvenating demonstration of high cultural vigor still subsisting in continental Europe. There is, in other words, striking evidence of cultural growth away from its traumatizing twentieth century. Indeed, Mr. Alcaraz is testimony to the enduring procession of humanity and its organic splendor to evolve in a movement away from bygones. We may consider the work not an abdication per se, but an expansion of the Western mind beyond a ferociously methodological analysis of the philosophical object to be known completely by the subject. It is this promise, if not blind faith, in man’s rationality that was the wheat grains of ancient Athens to then be replanted and harvested nutritiously in the Age of Enlightenment. Fine art’s procession away from concrete reality occurring near-simultaneously with Immanuel Kant’s Copernican Revolution in Western Philosophy, in which he demonstrated the wisdom of the East in Its understanding of the phenomenal representation of objects, is uproariously bequeathed with works in this collection such as Procèso Para Reducir Esta Habitación A Pintura (Process to Reduce This Room Into A Painting) and A La Pintura (Diptico) (Diptych). Mr. Alcaraz’s incessant mastery of expressing the idea of being in his work through the play of the compositions’ anterior space but with most novelty, the posterior space behind the canvas, playfully and invitingly massages our preconceptions of observing the objective. Where, for instance, does the artwork begin? Where does it end? And when? It is the distillation into visual art the articulation of the climax of the Enlightenment: mankind’s representation of the objective world is permanently incomplete. To express banal and convoluted yet important philosophy elegantly into symbolic expression is unheralded and the sign of extraordinary creative genius. Furthering the accessibility of his art, Mr. Alcaraz is playful with his creations. I’m tempted to describe his novel arrangements of lines and light reflectivity as mockery as he is so masterful at making these integral elements to fine art submissive to his agency. But that suggests a condescension toward the elements; that he has a latent antagonism to their restrictions. 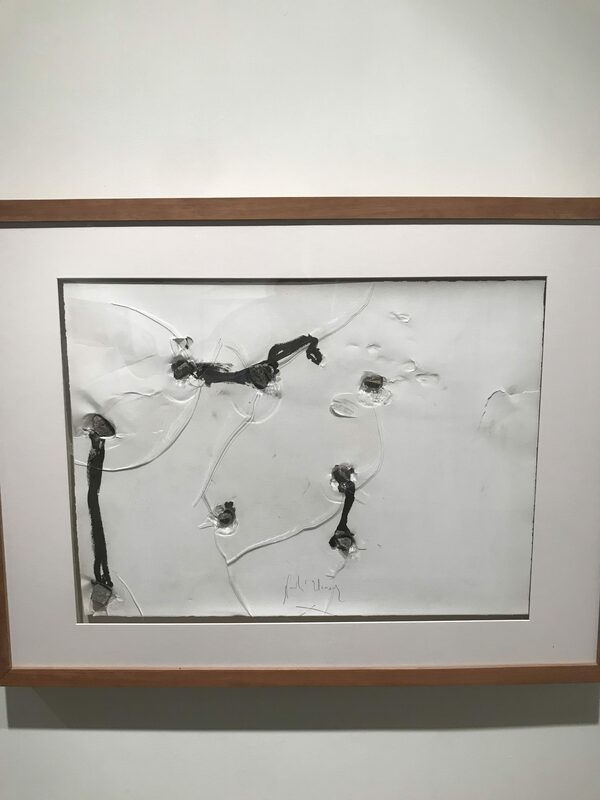 He can clearly express evocative, violent emotions with his Primero Libro De Dibujos (First Book of Drawings), with a stone-shattering assemblage of plexiglass which indicates an artist’s discontent with the limitations of lines. Perhaps, then, we see in his own artwork of his playful glee of making lines his master via an edification of what they can be in Levantar un Dibujo (To Lift a Drawing)? Us mortals accept their limitations; they give us boundaries to our condition; Mr. Alcaraz shakes his head in disappointment and educates on what our boundaries can really be: limitless. Ultimately it is this humanist appreciation in his work which makes it a categorical contribution to High Culture. His amicable use of industrial and anthropic materials coalesced with the natural formation of rock and metal, suggesting an unseen harmony with the elements rather than dissonance, furthers to embolden humanity to stretch and grow toward seeing the light – toward becoming beyond ourselves.